As a Los Altos homeowner who’s facing expensive hardwood floor repair, you’d like to simplify your life. You want to keep your floors looking beautiful, ideally for eternity. Can it be done? Can you really prevent scratches — or at least minimize their occurrence? Sadly, even if you use the most scratch-resistant type of wood, and you plaster your place with foam and cotton, floors will get scratched. It’s a fact of nature. The second law of thermodynamics tells us that “things fall apart” and entropy increases over time. That being said, you can take 7 powerful actions to prevent hardwood floor damage. 1. Wear slippers around the house — or at least take off your shoes. Make it a “house rule” that visitors need to take off their shoes. Make it easy for people: include a bin near the front door, where people can toss their shoes. Consider buying “guest slippers” for people to wear around. 2. Cover the most “wear and tear” prone areas with appropriate substances. Protect highly trafficked areas with mats, area rugs, and the like. Put felt pads underneath heavy furniture, so the furniture won’t gouge or scrape the floor. Get extra pads, since these “little felt helpers” inevitably fall off during the course of life. 3. Get the right furniture. Rather than a rolling chair (which will grind grime, grit and other nastiness into the floor), get a standing chair. Or at least put an anti-scratch mat underneath the rolling chair! 4. Keep your place tidy. When you allow grit, debris, food, nail clippings, etc. to accumulate, you create aesthetic unpleasantness and indoor pollution risks, as well as increase the chances of gouging your floor. 5. Keep your pets’ nails trim, and educate your kids about the importance of not gouging the hardwood floor with their toys, or utensils, or teeth. 6. Using appropriate cleaning tools and chemicals. 7. Don’t make your maintenance choices in a vacuum. Different types of wood have different sensitivities. The team here at Elegant Floors can help you fix or install or refinish your floors. 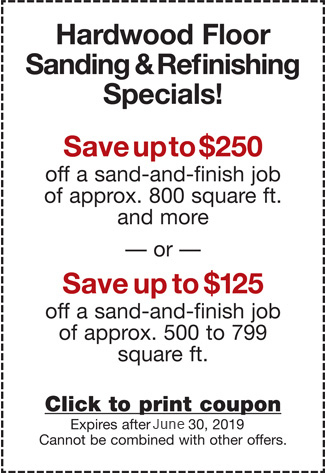 Call us or email us today for a free estimate. Protect your investment and peace of mind.